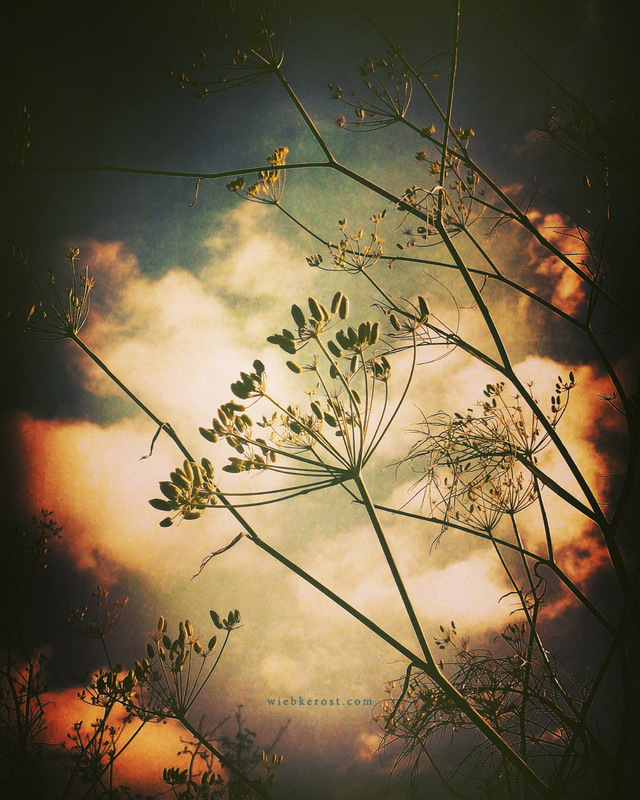 Sometimes I like to spend a moment in the sun and just watch the fennel sway in the wind… I perceive it as an ultimate summer/air plant, which also has the power to clear a chaotic mind as well as inspire artistic vision. I sip some fennel tea in the evening and when my mind feels tired or scattered, as it brings back focus and clarity. The seeds I have here are very aromatic, sweet but also with a strong anise-like or camphorous note. They make a fine addition to prophetic incense blends, as well as oils and decoctions. The name probably comes from the Middle English fenel or fenyl and Old English fenol or finol. The English names originate from Latin feniculum or foeniculum, which are the diminutive of fenum or faenum, meaning “hay”. Old English finule is one of the nine plants invoked in the pagan Anglo-Saxon Nine Herbs Charm from the 10th century. The German name is “Fenchel”. In Germany it is also called “Köppernickel”, which refers to a number of aromatic herbs in the Umbelliferae family. Greeks referred to a plant called marathon (μάραθον), after which the place Marathon, literally the ‘place of Fennel’ is named. The plant was also known as Ferula in Latin, which later became the scientific name for the giant fennel (Ferula communis). Legend tells, the hero Prometheus carried the fire he had stolen from heaven on a fennel stalk. Hence fennel is also known as ‘torch plant’ (for similar use see Mullein). The thyrsus of Dionysus was a fennel stalk topped with a pine cone. This wand clearly had phallic associations and was worn and thrown in the air during the Bacchanalia. The ferule was named also after the plant and referred to a rod used for chastising disobedient pupils. The Hittites used fennel (ZÁ.AḪ.LI or marašanha) to curse the destroyed cities of their enemies. Roman soldiers chewed the seeds before battle to strengthen confidence and courage. Ancient Romans also referred to the plant as ‘herb of sight’, since it was thought to clear the eyes. Fennel features in medieval protection and fertility spells, e.g. it was used in washes on the farmer’s plough and as a strewing herb in the home and barn in order to purify, keep out ‘evil’ and increase fertility. The seeds placed in keyholes were believed to keep out ghosts. Used are the bulb, foliage and seeds. Fennel bulbs cooked as a vegetable come from a cultivar, the Florence fennel, which also has a mild anise-like flavor, but is more aromatic and sweeter than common fennel. I like to combine fennel with fish and turkey. An expensive spice, called spice of the angels, consists of pure fennel pollen. Fennel seed is used as a flavoring in some natural toothpastes and Mukhwas, a colorful Indian after-meal snack, which aids digestion and is also a breath freshener. Besides this fennel seed is one of the three main herbs used in the preparation of absinthe. Fennel syrup eases chronic coughs. Fennel tea relaxes the stomach and reduces bloating. Fennel is also diuretic and might be used as a treatment for hypertension. Fennel oil is used in aromatherapy for calming the mind and relaxing. In India fennel seeds are eaten raw for improving eyesight. The notion fennel has eye clearing properties has a long tradition. Ancient Romans regarded fennel as the ‘herb of sight’. Root extracts were often used in tonics to clear cloudy eyes. Extracts of fennel seed have been shown in animal studies to have a potential use in the treatment of glaucoma. Fennel contains anethole and is a source of phytoestrogens, which promote growth of breast tissue. Though it does not promote lactation, an old superstition hods that fennel was a galactagogue. Fennel repels fleas, e.g. powdered fennel drives away fleas from kennels and stables. Fennel seed is a bird feed. A quick first aid for young birds that have fallen out of their nest and occur starved is dextrose/honey solved in fennel tea. Fennel is a nectar source for hover flies and other insects with short probosces. Hoverfly larvae are useful creatures in the garden, since they feed on aphids (one hoverfly larva may devour as many as 700 aphids during its development), thus providing long-term protection for infested plants. Besides this birds eat the seeds, which is why one should leave some for the winter rather than cutting the plants down. Fennel prefers a spot in full sun and requires good drainage. It doesn’t tolerate water logging. The soil should be nutritious, loose and humid. Besides this it may need wind protection, though some cultivars grow strong enough stems and won’t snap off as easily. Fennel may endure longer drought periods. However the bulbs, which are eaten as vegetable, can burst and become inedible if the ground is too dry. Fennel can be biennial or perennial. My fennel plants are 4 years old by now and come back every year. The upper parts die off in autumn. Fennel is native to the Mediterraneans and not hardy, though tolerating some mild frosts. In late autumn I cover the plant base with twigs and mulch and some raw compost soil. This is also the only fertilizer they require. The plants reach over 2 meter in height and are certainly a prominent sight in the garden. Hence plant at least 30 cm apart, single or in small groups of three. Fennel is traditionally planted in combination with lettuce. But it is also a beautiful ornamental plant. The sulfur yellow flower umbels and light green stalks are a nice contrast to plants with darker foliage, such as monkshood and yew.